A SWAT team negotiated with the shooter, who in turn surrendered to the authorities. Photo: Gene J. Puskar / AP. 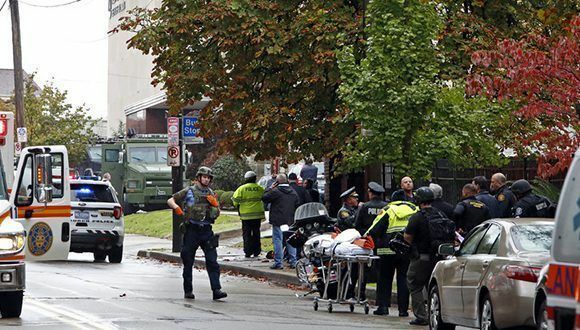 A heavily armed man has perpetrated a shooting inside a synagogue in Pittsburgh, Pennsylvania, before surrendering to the authorities. Eight people have been confirmed dead in the attack on the Tree of Life Jewish congregation in Squirrel Hill, where a strong police operation has taken place. In addition, an unknown number of wounded are reported, including police officers who were shot during a confrontation with the suspect. Police sources indicated that the gunman entered the religious center this Saturday morning while shouting, “All Jews must die.” The suspect opened fire both inside the facility and against officials who responded to the emergency call. Initially it was reported that the man was in possession of an AK-47 machine gun, but officials later indicated that they believed it was actually an AR-15 rifle, as well as other smaller caliber weapons, NBC reports. Other media report that it also carried an alleged explosive device. “Alert: There is an active shooter in the Wilkins and Shady area. Avoid the area,” the Pittsburgh Department of Public Safety said on Twitter. It later transpired that a SWAT team negotiated with the shooter, who in turn turned himself in to the authorities. The suspect was injured as a result of the agents’ response, who had to use their vehicles as shields against the attacker’s armed reaction. Officials have identified the suspect as Robert Bowers, 46, a well-known white supremacist in communities in the Network of neo-Nazis and far-right extremists, according to reports citing police audio recordings. Some media reported alleged audios of officers who attended the scene. “The suspect talks about all these Jews having to die. We are still communicating with him,” an agent would have said. “The suspect talks about killing Jews. He doesn’t want any of them to live,” another policeman is quoted. It transpired that at that time there was a Saturday service in different parts of the synagogue, and the version is handled that in the building there were almost one hundred people. The police claim to have received several calls from people barricaded inside the temple, and launched an evacuation operation. The president of the United States, Donald Trump, pronounced on the matter. “There seem to be several dead. Beware of the active shooter. God bless everyone,” said the president. On the other hand, Carnegie Mellon University, located near the Tree of Life religious center, is reported to have been closed and students were instructed not to leave the area.